At the heart of any solid agile consultancy is the ability to provide a set of interactive courses that help clients adopt agile practices. We have over 15 years of experience in helping to train and guide organizations in their successful agile adoptions. Many other agile courses, certification level and not, are simply too academic, beginner level, game focused, and purist in nature. For example, we can't tell you how often we've encountered CSM certified individuals who can't begin to effectively jump-start a Scrum team or write a solid User Story. That's just sad. So, what makes us different? First, it's the real-world experience that Bob and our other instructor/coaches bring to the table. We've all been practicing "Agile" for over 10 years. Bob has been doing it from the very beginning, since the late 1990's. Not just writing or talking about it...but doing it! And every instructor has deep, practical, in-the-trenches experience. So, when they share a story, suggest approaches, or offer advice, it's always steeped in pragmatic, real world experience. This combination ensures that you'll come out of our classes with as much entry to advanced level information as the time will allow. In fact, we always customize our classes on-the-fly to your highest priority needs and challenges. At the moment, we are not a Scrum Alliance CST or affiliated with any other certifying body (and there are quite a few out there). This means that we can't generally grant certifications as part of running public classes. We feel that this level of independence and our deep experience makes a HUGE difference in our courses in that we can cover what we feel is important versus preparing you for a test. However, if you're truly "stuck" on certification, ask us for recommendations. We've established partnerships with some leading CST's, so we can offer that option as part of our coaching and consulting practice. But what we CAN DO, is grant CSM and CSPO certifications as part of our coaching efforts. This is a new capability that the Scrum Alliance approved in 2016. We can grant either certification with a minimum of 25 coaching hours (face time) that includes individual, team, and small group coaching and classes. Bob is an approved as a Certified Agile Leader Educator with the Scrum Alliance. It means we can deliver a 2 1/2 day class to achieve the certification. This class significantly compliments our coaching engagements in that it gives us a leadership training vehicle similar to what we've been doing at the team level. The CAL class will mostly be delivered privately within our client organizations. It has tremendous impact when delivered in that way, as you can see in this blog post. There will also be a select number of public classes. Look for them on the Scrum Alliance website. 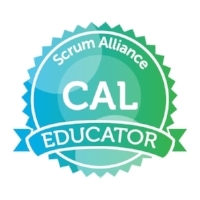 More information on the CAL can be gleaned at the Scrum Alliance website here: https://www.scrumalliance.org/agile-leadership or by viewing our CAL class overview here. We offer five outstanding agile classes for new and experienced teams alike. If you're looking for in-depth and experiential agile training, RGCG provides it. No fluff, just experience that matters! Introduction to Scrum: Basics, Roles, Planning, Execution, and Excellence -- This 2-day course is intended as a basic introduction to Scrum that enables teams to immediately begin sprinting. It is equivalent to the CSM (Certified Scrum Master) classes, but doesn't include the certification. In fact, we believe it does a better job of preparing teams' for execution effectiveness. Get the brochure. Scrum Mastery -- This 1-day class is a "Masters Level" course designed to advance your Scrum Master skills to the next level. It is highly situational and focused towards the needs of the attendees. Expect to leave with a new understanding of the role of Scrum Master and skills to be excellent. Get the brochure. Scrum Product Ownership Excellence -- This 2-day or 3-day class focuses on all aspects of Scrum Product Ownership. Bob literally wrote the book on Product Ownership and will share the nuance behind performing well in this important role within Scrum teams. It is equivalent to the CSPO (Certified Scrum Product Owner) classes, but doesn't include the certification. In fact, we believe it does a much better job of preparing Product Owners to handle the day-to-day challenges of the role. Get the brochure. Agile Leadership Practicum -- This 1-day class addresses one of the fundamental challenges in organizations facing agile transformation - how to effectively lead your agile teams. If you want to create high-performance agile teams and realize the productivity promises of agility, then you need your Managers, Directors, VP's, and C-level leaders to attend this course. Get the brochure. Transitioning from Traditional to Agile Testing -- This 1-day class introduces organizations and testing groups to the fundamental shifts required in moving from old to new techniques. Often the testing (team, techniques, strategies) are left behind in an agile transformation. This class serves to help move you towards a more effective quality and testing mindset when making this transition. Get the brochure. and other topics as well. Just reach out with your needs and we probably have the ability to form and deliver training that will meet them. Most of our time is engaged in coaching and running internal, private classes for our coaching clients. Occasionally we run public classes. If you're interested in any of these classes, please reach out to us with your request.